Although I loved the 171 to bits I always dreamt of upgrading to the serious 12v sets. It turned out I had to wait almost 25 years and suffer the indignity of a dark age before I could start my 12v collection. More photos in my Flickr sets. Awesome trains man! I love the 12v trains, if only they were 9v trains. You have a really nice layout, and I would love to see it expand for a public display. 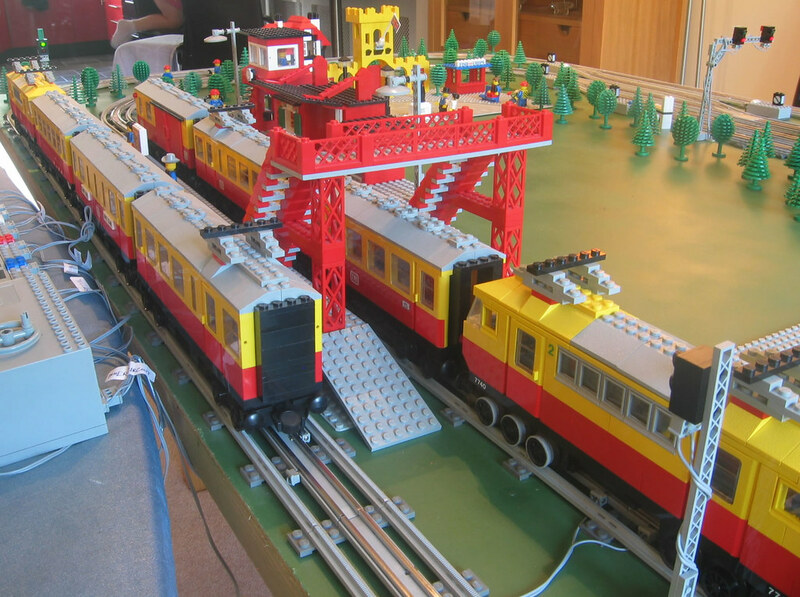 That was the most fun I've ever had with LEGO, sharing it with others at train shows. Keep us posted on developments in AJW City! 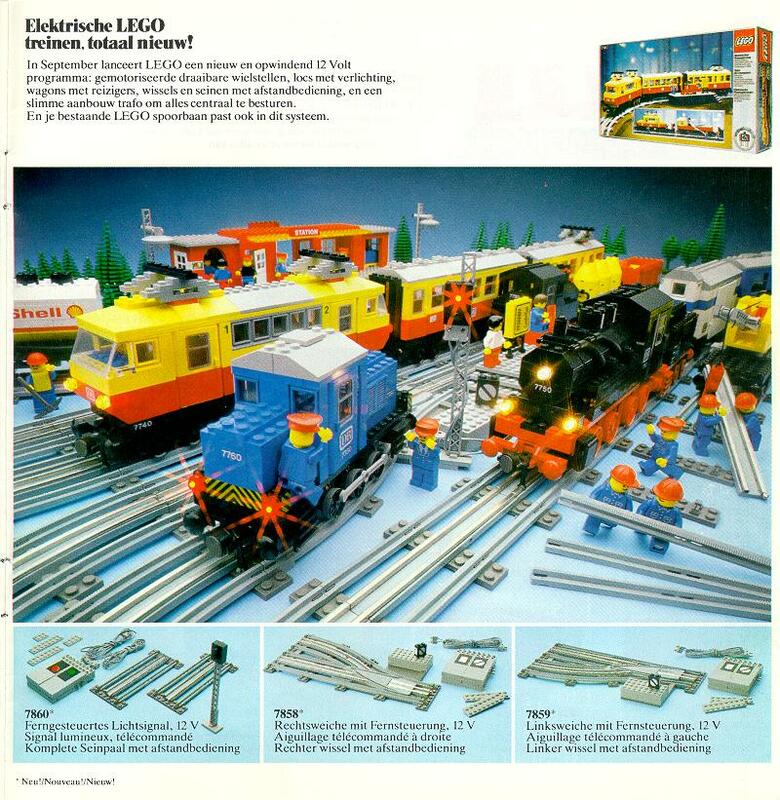 As you 've already mentioned, looking at 12v trains and catalogues (the train scenes in the official LEGO catalogues were always a thing to remember ) is really enjoying! Although 12v trains were never released here in Greece , I had a half german cousin back in the 80's and I had a constant contact with the 12v era. I even managed to get the 7735 Freight Train from Germany and I remember I was one of the happiest kids in the universe. Your layout looks great as it develops! Keep expanding and keep posting pictures! 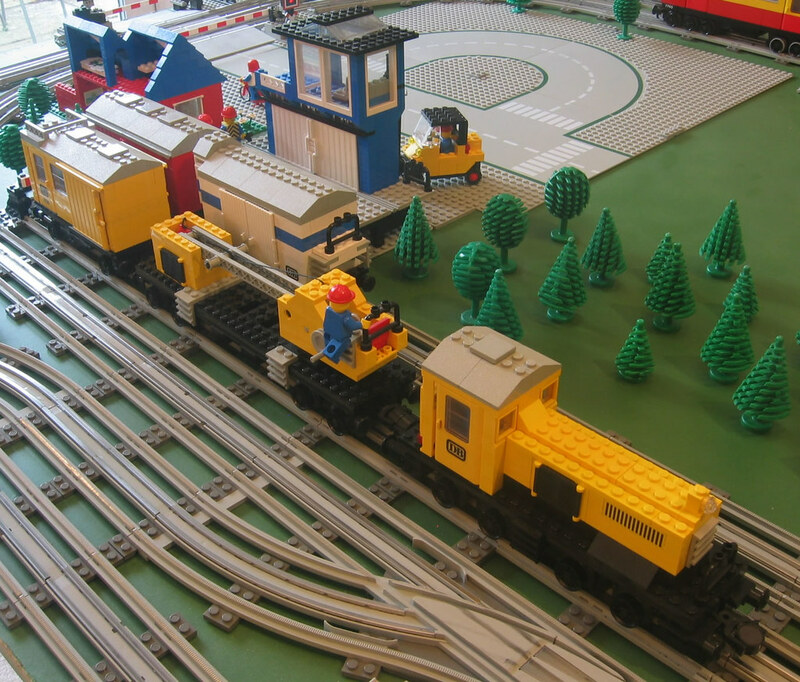 Amazing collection of 12V trains! It must've cost you a little fortune to acquire them after your dark age. Though I'm a 9V guy, I love the classic charm the 12V trains spread. And your trains look very clean. I cannot see dust on them in contrast to my trains. Amazing collection of 12v stuff there! Thanks for posting the catalog pictures as those are always very nice to look at. When I was a kid, those 12v train ads were what really drove me to get into the Train/Town theme. I'm looking forward to seeing more pictures of your layout as it evolves. AJ: This truly is a fantastic collection of great 12V sets. I absolutely love your collection, and how I wish that I had a chance to pick up some of these classic trains again (at a reasonable price). Your layout is equally impressive. How many pieces of track do you think you have in your layout? EDIT: This deserves a BLOG! Yes they do have significant value as collectors pieces not just as 'toys'. I have been buying and selling Lego for five years now so I like to think this collection has cost me a fraction of it's real value. My wife keeps on eyeing them suspiciously and asking "and how much are these worth?" As for the dust, I keep all my sets in a large cupboard. So they are stored in the dark which keeps the bricks the correct colour and significantly reduces the amount of dust that settles on them. I have to go over each one every couple of years and brush the dust off with a soft paint brush. Thanks for blogging my submissions Brickster, it's really rather flattering. I love the graphic you assembled for the post on Classic-Town.net, totally superb! Is there ever going to be a Classic-Train.net? Very nice layout and amount of 12V cars and engines as well, AJW! I just started with 12V trains. Taking into account I have a lot more 9V trains and tracks I´m not sure to expand the small 12V oval track. In private : How much did you pay for all this awesome stuff? Hello, can you please tell me what the dimensions are of the board you are using as I am looking to create a similar layout. 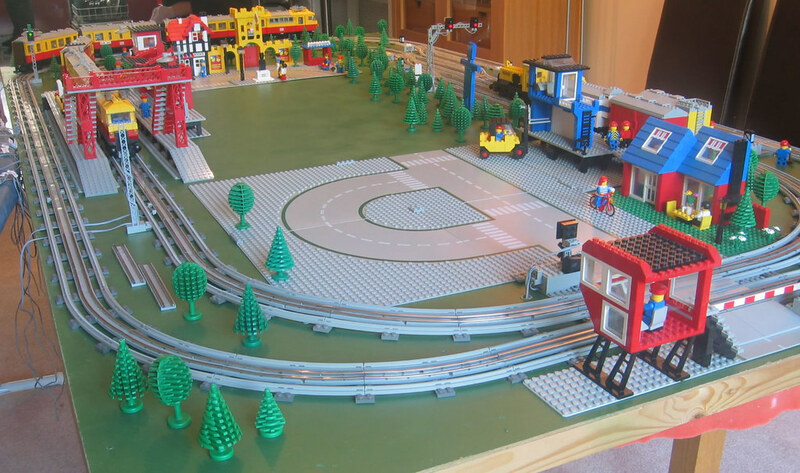 Looks like a nice little layout and a nice selection of trains to run on it. while this collection is incredible, please do not bump a 3 yr old post just to ask a question. Maybe start a new thread discussing your interests and current questions? You can also find a lot of good information in the Train Techopedia forum pinned at the top of train tech. That said, you can build a circle of standard lego curves on a 3x3 grid of baseplates (32x32), i.e., 96 studs in diameter (or 30 inches) and you'd have 4 studs on the outside of the circle at the extreme points. Straight track segments are 16 studs long (8 inches). If you are looking for software, I'd suggest bluebrick. Glorious 12v! I love to see these sets, and you inspiration and dedication is to be commended. My pre-emptive apologies, but your experience has trigger a monsoon for me! We have a similar original and initial 12v era childhood disappointment. For I, too, received the push-along set 171 instead of glorious new-age-of-gray set. The year was 1981. I was 11 years old. The local toy shop in Grantham, Lincolnshire, offered the showcase LEGO® catalog of the new age of gray sets. I salivated. I dreamed.... and I got the blue track 171... sigh. A short time in England-- about 5.5 months-- then I was back in the USA, without a gray 12v set. Even a trip through the European continent countries of Germany, Switzerland, and even Denmark-- with a trip to LEGOLAND, didn't win for me a gray treasure. In fact, the lone chance I had, a toy shop in Switzerland, was thwarted by the ever-haunting words of my father, "Wait until we get to LEGOLAND, I'm sure they'll have all the new sets there..." Famous last words. He (rightfully) didn't want to haul a LEGO set around Europe for 3 weeks. Waiting until LL was the right thing to do. But, upon arrival at the LEGOLAND in Billund, no new gray era 12v sets were to be had. We were informed that Germany and Switzerland received first product drop due to market penetration. Bummer! That was a very sad day for that 11 year old boy. They inspire more than play. They harbor our childhood treasured dreams. As zephyr1934 mentioned, please keep in mind that this is a 3 year old topic and that AJW hasn't been around in a long time. Well blow me down, this takes me back a bit, sorry to keep bumping a very old thread! Unfortunately due to change of circumstances I had to slim down the collection quite substantially. I had to disassemble the track and sell some of the rolling stock, although I have kept the real gems of the collection. Also, to be brutally honest, the layout did not get the use it deserved in my house so I wanted to relinquish some of it to a more worthy owner. @Ben - the base board is approx 230 cm long and 122 cm wide. I still have it, so if you live in the south east of England you can buy it from me for a small fee!! @James - a great story. It must have been rather baffling to arrive at Legoland and not find any grey 12v sets! I loved the 12V trains I wished I bought more of them but for now I only have 2. (I also own the 171 by the way). But growing up I had to make some tough decisions what to do with my money. I bough all sorts of LEGO, books, comics and later on Transformers. Looking back I wished I only bought LEGO and especially 12V trains. I don't own the books, comics en Transformers no more but all what is left from childhood is my LEGO. The positive thing is I own a lot of track for 12v. the downside is one of the engines is broken beyond repair. But I love seeing your collection. 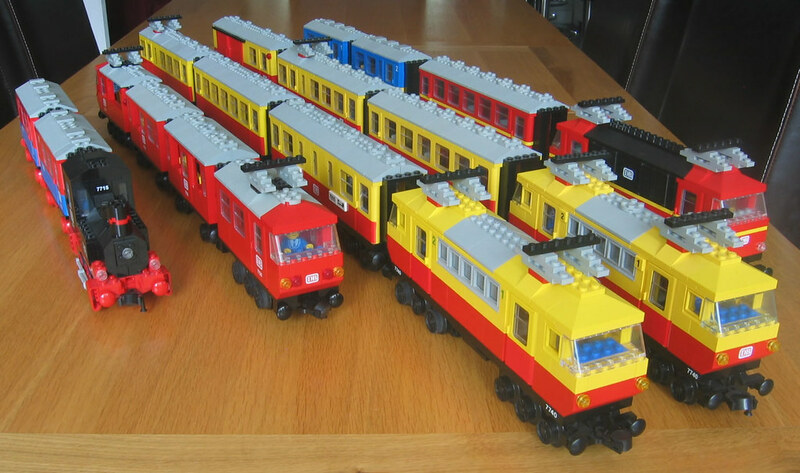 To be honest, I think that 12V trains are cooler than the 9V trains. But, if we're looking at more realistic it'd be the 9V. I do like most the German locomotive red/black with yellow strip! I'd like to build it too!